The 700-strong force arrived by RAF Chinook and Royal Navy Sea King helicopters, Viking armoured vehicles, Leopard tanks, and on foot, and achieved total surprise in the latest phase of Operation AABI TOORAH ('Blue Sword'). "This was a very successful, deliberate joint operation that demonstrated clearly to the enemy that the Task Force continues to operate where and when it chooses. Marjah has previously been a safe haven for the enemy; we have shattered that illusion and more will follow. We will continue to erode the capability and influence of the enemy and enable the extension of legitimate governance throughout Helmand." This latest phase of Op AABI TOORAH had three main objectives: firstly, through rapid manoeuvre and build up of combat power, to surprise the enemy and disrupt their movement and planning; secondly, to confuse their situational awareness by hitting their fighting forces across several of their key, central locations; and finally, to allow the spread of legitimate Afghan governance, further enhancing the stability of the neighbouring districts of Nawa and Nad e-Ali. Marjah has long been a region that the insurgents claimed as their heartland, a place they felt secure and where they could gather, equip and train their forces. It was also where they moved and stored weapons and explosives, and where the links between the insurgents and narcotics trade have been at their strongest. 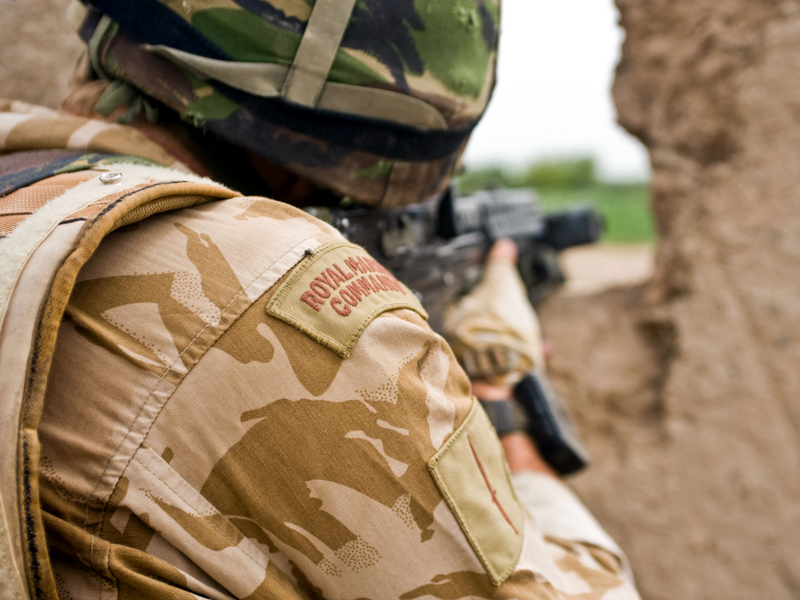 The three-day operation was conducted by 500 Royal Marines from 42 Commando Royal Marines, 120 soldiers of the Danish Battle Group, British Viking armoured support vehicles, elements from the British Army's explosive ordnance disposal teams, and the Afghan National Army's 205 Hero Corps. It was the first of many major operations into this area, and resulted in a resounding defeat for enemy forces with ISAF (International Security Assistance Force) and the Afghan National Army (ANA) setting the conditions for other forces to return to conduct operations in the future. Op AABI TOORAH began with the pre-positioning of the Danish tanks, previously used on Op SOND CHARA in December to great effect, and British Vikings. The first Royal Navy helicopter insertion was of K Company, 42 Commando Royal Marines, followed by the Commando Reconnaissance Force (CRF), both as an outer cordon and into the very centre of the Trikh Nawa district, which is sandwiched between Nad e-Ali and Marjah. This was followed very quickly by further helicopter-borne troops, as Lima Company, 42 Commando Royal Marines, landed covertly in the desert and yomped (walked) several kilometres, each man carrying upwards of 100kg, to the objective codenamed SILVER. There they took the enemy by surprise, hitting them and moving on, constantly putting the enemy on the back foot. The aim was to confuse the enemy and force them to show their locations, flushing them out for the ISAF troops to strike. The three sub-units of the CRF and Kilo and Lima companies worked in concert, one always static in a position to cover the move of the others. In this way, engaging the enemy both from the flanks and from within, the troops' movements were hidden from the enemy and each time ISAF offensive action surprised them, drawing them apart. The enemy's confused reactions enabled the ISAF and Afghan forces to pull them away from their command structures and defeat them in place. "The enemy action we have seen looks to us like an attempt to delay us, as they are focusing on defending Marjah. This really is the gold standard 'tick in a box' for us in terms of the mission we have been given, so we are quite happy with the state of play at the moment." With the CRF initially inserting into the heart of the enemy positions, at helicopter landing site PLATINUM, Kilo Company secured a canal crossing point to the north; this crucial resupply point would both control the area and stop the enemy reinforcing their locations. Simultaneously, Lima Company moved from SILVER towards the southern objective BRASS in order to control vital road access and prevent the enemy fleeing with their arms and explosives, and reporting to their command teams in central Marjah. At the same time the Danish Leopard tanks were in an overwatch position on high ground to the north and west and were used throughout the battle to engage, from range, the well dug-in enemy positions. As the troops moved through their own respective areas they cleared compounds of enemy forces, securing the area and taking time to speak to and reassure the local people, before moving on to the next location. On occasions the pitched battles were fierce but the capability and training of the ISAF and Afghan forces overmatched the enemy at every turn. At the same time, to the north east of the Nad e-Ali area, the ANA was conducting patrols to reassure the local population of the continuing security, stability and governance in the area. Over the three days the enemy tried to rally and put up a strong defence. The fighting was constant but the tempo always controlled by the ISAF and Afghan forces. The enemy, although determined and tenacious, were clearly overmatched in every sense and comprehensively beaten. "From my position as a troop commander, the tempo of the battle and the 360 degree nature of the close-quarters fighting brought out the very best in the guys. Fighting from compound to compound with up to 100kg of equipment under constant and accurate enemy fire, the Commando ethos between us allowed the troop to decisively overmatch and defeat a determined enemy force." When the Commanding Officer of 42 Commando Royal Marines, Lieutenant Colonel Charlie Stickland Royal Marines, was content that he had achieved his aims, he systematically withdrew his men, always keeping 'one foot on the ground'. With the safety of a covering group, sub-units yomped to desert pick-up points where Viking vehicles and Sea King and Chinook helicopters collected them and transported them back to Camp Bastion. "We inserted rapidly before dawn to shock and dislocate the insurgents. Through aggression, agility and guile we removed significant numbers from the battlefield and psychologically paralysed them across the central Helmand belt. Then, importantly, we left at a time and place of our choosing, with the enemy wondering where and when we would strike again." An immediate and positive outcome of the operation was the shura held by District Governor Habibullah and the Nad e-Ali District Community Council with elders from Marjah to discuss security and development. The aim is to enable the people of Marjah to express their wishes for development through their representatives on the Nad e-Ali Dictrict Community Council, and to share in the progress already enjoyed in Nad e-Ali since Op SOND CHARA.